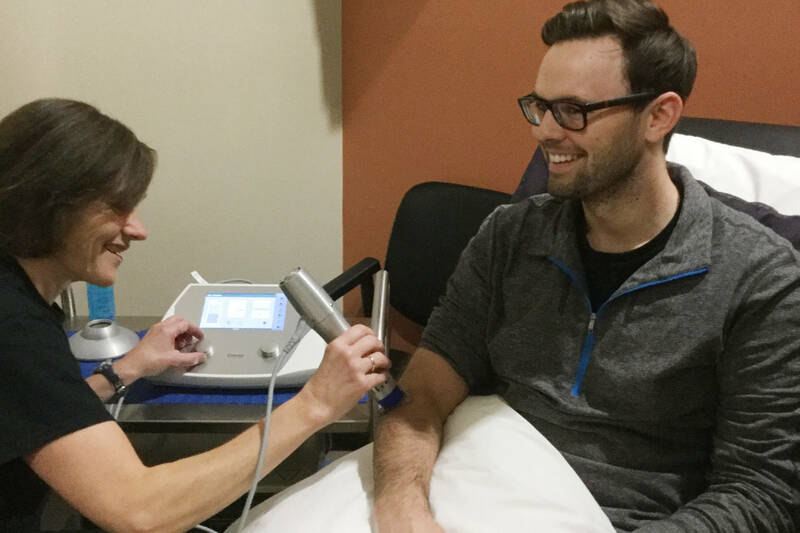 Lifemark physiotherapist Annick deGooyer uses the clinic’s new Shockwave therapy with Steven Sasyniuk. If you’ve been struggling with chronic painful conditions like tennis elbow or plantar fasciitis, a new physiotherapy treatment may help you turn the corner on recovery. Shockwave, a familiar tool in other areas of medicine, is proving useful in physiotherapy for patients who haven’t responded to other treatment for chronic tendinopathies – commonly referred to as tendinitis, explains Annick deGooyer, physiotherapist and Clinic Director Lifemark’s West Kelowna location. Whether from sport, over-use or repetitive strain, common conditions Shockwave might help include tennis elbow, achilles, rotator cuff, plantar fasciitis, jumper’s knee or calcific tendinitis of the shoulder. “Having shockwave available to use with our patients means we have another tool for stubborn, chronic tendinopathy,” deGooyer says, noting Shockwave is available in Lifemark’s Capital News Centre, Richter and West Kelowna clinics. Shockwave as physiotherapy: what is it? Originally developed for use in treating kidney stones, Shockwave therapy is becoming more common in the field of physiotherapy, where it uses a much lower energy than in medical applications. Shockwave therapy, or extracorporeal shock wave therapy (ESWT), treats a variety of musculoskeletal conditions, primarily those involving connective tissues such as ligaments and tendons. Emitting high-energy pulses through the tissue being treated, Shockwave causes localized microtrauma which stimulates the body’s healing processes and cell growth. What does Shockwave treatment look like? Each patient is assessed by their physiotherapist at their first visit to confirm whether they’re an appropriate candidate for Shockwave therapy. Shockwave treatment is usually performed weekly for three to six weeks, depending on results. While the treatment can cause mild discomfort, it only lasts four to five minutes, and physiotherapists can adjust the intensity to keep it comfortable. “As physiotherapists we can get as frustrated as our patients when they don’t get better, so we’re happy to be able to offer another option,” she says.